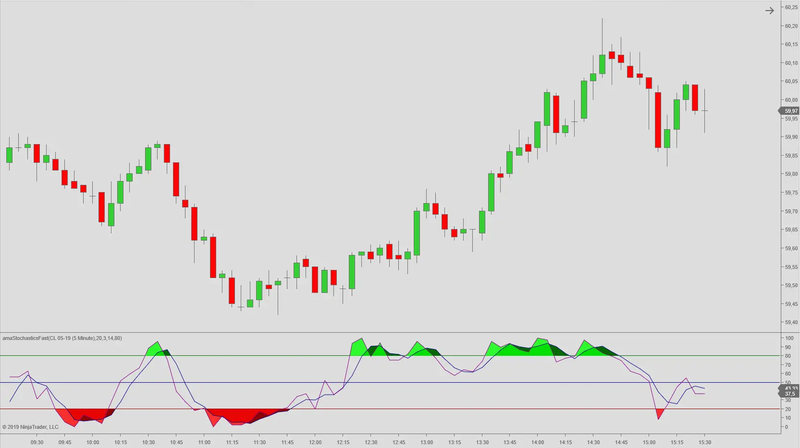 The Fast Stochastic indicator supplied with NinjaTrader cannot be used with an input series other than price. We have recoded it so that you may apply it to other indicators. To do so, simply select any of the other NinjaTrader indicators as input series. 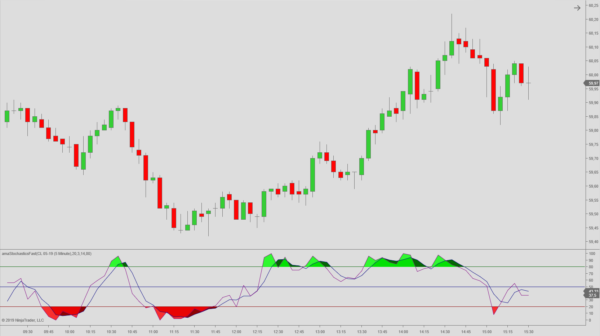 As with the standard Stochastics oscillator, Fast Stochastic compares the closing price to the range over a certain period of time, effectively making it a momentum indicator. Because it is range bound, the Fast Stochastics indicator is useful in identifying overbought and oversold levels. The range is defined by values from 0 to 100 where values below 20 express an oversold scenario (trading near the bottom of its high-low range) and values above 80 overbought (trading near the top of its high-low range). Of course, these levels may be adjusted to fit the characteristics of the market you trade. The Fast Stochastics indicator differs from the standard version in that the Period K line is not smoothed.